EBLEX has launched a new guide for caterers together with a new cattle and sheep weekly. The latter is in response to feedback from levy payers wanting accessible market information. The Cattle and Sheep Weekly replaces the UK market survey, which has been published in a similar format for over 40 years, and its sister publication the European market survey. The new two-page publication, one page each for the cattle and sheep markets, will be published every Friday. The shortened format will provide key market indicators, analysis of prices and short articles on other topical market issues or data releases, including slaughterings, trade, consumption and census data. More in-depth analysis of these and other market issues, including full coverage of international markets and supply forecasts, will be provided in the monthly Cattle and Sheep Market Update, the first edition of which will be published at the end of this month. Complementing the information available in these publications, a suite of additional data is available online at www.eblex.org.uk/markets/. These spreadsheets are comprised of information from the two existing weekly publications, and include historical data to enable the easy identification of trends. “For some time we’ve had requests from producers to publish this information in a format which is easier to digest,” said EBLEX sector director Nick Allen. Entitled ‘Excellence’, the guide details the procedures, standards and specifications behind the scheme, describing how sourcing Quality Standard Mark beef and lamb can add value to a caterer’s business and detailing the farm assurance criteria that the farms must be accredited with. The guide goes on to examine the diversity of the beef and sheep industry in the UK, and the importance of seasonality and speciality breeds. 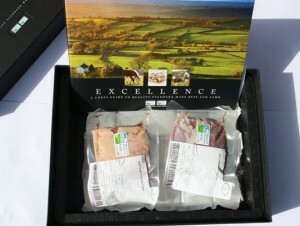 It gives an overview of the current market for beef and lamb, and includes a detailed analysis of the halal market, as well as a section on innovative cuts and the research and development behind the creation of them using seam butchery techniques, which help to maximise yield and carcase development. Excellence: A Chef’s Guide to Quality Standard Mark Beef and Lamb includes a collection of beef and lamb recipes from Michelin-starred chefs including Anthony Demetre and Lisa Allen.